STM32F100C is the 48pin LQFP package. Results were interesting to say the least. Prices are for 100 units, so not huge scale, but more than just a couple of prototypes. Prices are in USD, and were advertised when I wrote this post. This is just a quick note to self. Remember, never try and clear the flag that caused the interrupt as the last instruction in the ISR itself. It causes the ISR to reenter immediately. Your ISR/NVIC/EXTI interrupt will retrigger, trigger twice, whatever keyword you were searching for. It’s just a matter of doing it first. So, You got a STM32 Discovery board hey? Good for you! They’re cheap, and highly functional, but this ain’t your grandmother’s Arduino. 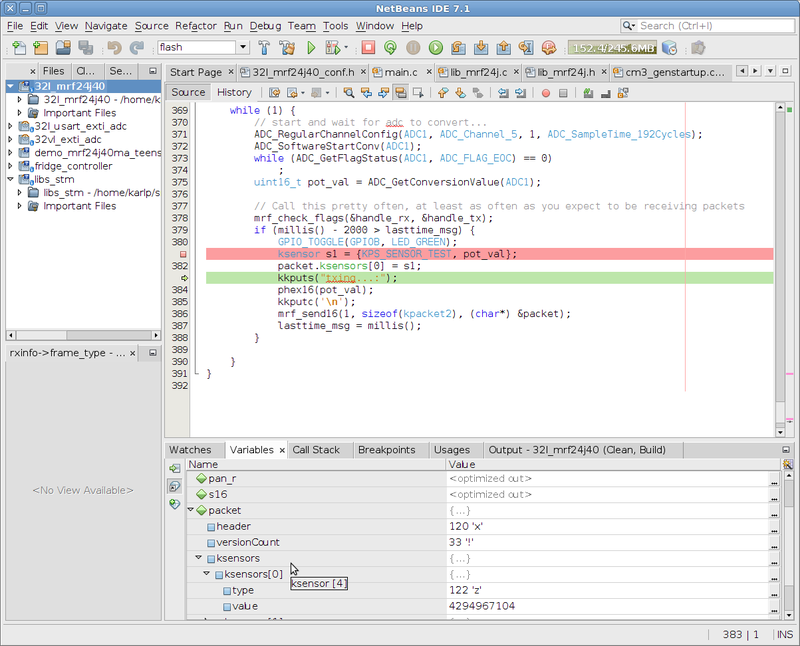 Here’s a rough and ready howto for developing in netbeans, and getting source level debugging for that code. 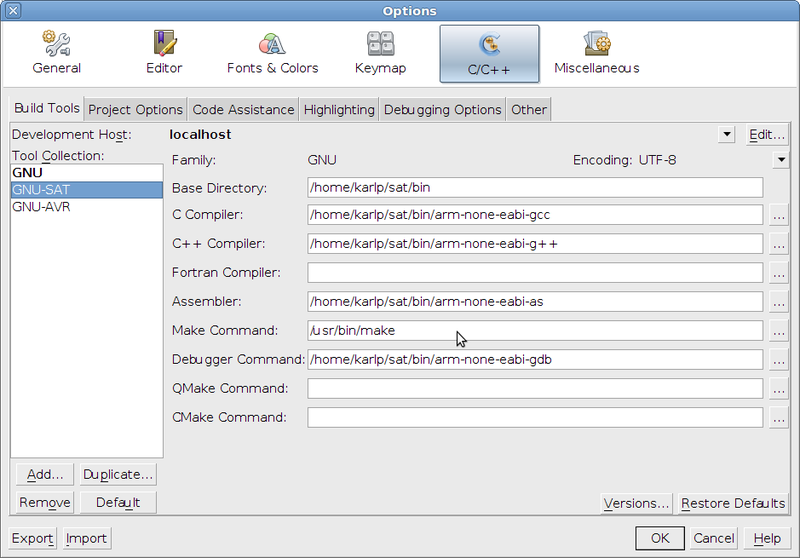 GNU arm toolchain installed and working. You want to make sure that you can successfully compile via make from the command line first. 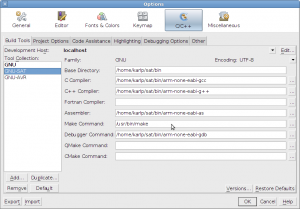 If you can’t compile with the raw tools, netbeans isn’t going to magically fix that for you. Duh, this post is covering that. You need the c/c++ plugin and the gdbserver plugin. Download it here. For reference, I’m using 7.1 at the moment. Import your project as a makefile based project from existing sources. You can get netbeans to actually do all the compiling and things for you, but I find it hard to share the project that way. Not everyone uses netbeans, but makefiles are pretty portable. Flash your binary to the target. You can actually do this anyway you want, but we’ll use stlink’s st-flash tool. Chip ID is 00000416, Core ID is  2ba01477. Whew, ok, just about there. 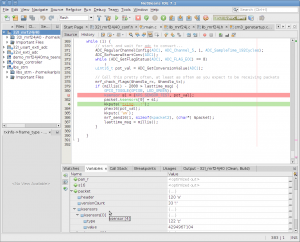 Now in netbeans, choose “Debug->Attach debugger”. Choose “gdbserver” and make sure you put in the right host and port, (normally localhost, and 4242) and make sure it’s set to debug your project. That’s it. If any of the steps are glossed over too much, mail me and I’ll try and update to clarify. Thanks to gsmcmullin on ##stm32 on irc.freenode.net for that gem. 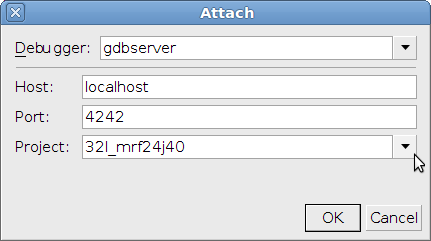 Update for netbeans 7.2: Apparently you now have to put “target localhost:4242” into the gdbserver box, not just “localhost:4242”. Really? Realllly? Ok, concise output is good, but this is no output at all! Probably the same people who think making a stdlib implementation that is GPL…. So yeah, we fixed the linux development and programming tools for the STM32 series of ARM cortex M3 chips. And I spent quite a few weeks getting distracted by the tools, and never got around to actually developing for the platform. “…..” What the… These pins could be anywhere! The reference manual doesn’t say, it refers to the datasheet, which has a table, “Table 5, Alternate function input/output” on page 35 of the actual device datasheet, revision 4. That table says that there are two SPI ports, and they can be made available on a variety of pins. Apparently, SPI1 and SPI2 can be made available on two separate sets of pins each!